CBS All Access, the CBS digital subscription video on-demand and live streaming service, has announced the second season renewal of its first original drama series, The Good Fight, for early 2018. The Good Fight is produced by CBS Television Studios. "We're only a few episodes into the first season and the reaction from CBS All Access subscribers and critics alike has been phenomenal," said Marc DeBevoise, President and Chief Operating Officer, CBS Interactive. "This series and its characters are just beginning and we can't wait to see where Robert and Michelle King, their creative team and the amazing cast take The Good Fight next." The first season of The Good Fight is now available to stream on CBS All Access with new episodes available on Sundays. The Good Fight picks up one year after the events of the final broadcast episode of The Good Fight. In The Good Fight, an enormous financial scam has destroyed the reputation of a young lawyer, Maia Rindell, while simultaneously wiping out her mentor and godmother Diane Lockhart's savings. Forced out of Lockhart & Lee, they join Lucca Quinn at one of Chicago's pre-eminent law firms. The series, from The Good Wife creators Robert and Michelle King, stars Christine Baranski, Cush Jumbo, Rose Leslie, Delroy Lindo, Erica Tazel, Sarah Steele and Justin Bartha. Robert and Michelle King serve as showrunners and executive producers of the series, which they co-created with Phil Alden Robinson. Phil Alden Robinson also co-wrote and executive produced the premiere episode with the Kings. Ridley Scott, David Zucker, Liz Glotzer, Brooke Kennedy and Alison Cross also serve as executive producers. The series is produced by CBS Television Studios in association with Scott Free Productions and King Size Productions. The series is distributed worldwide by CBS Studios International. 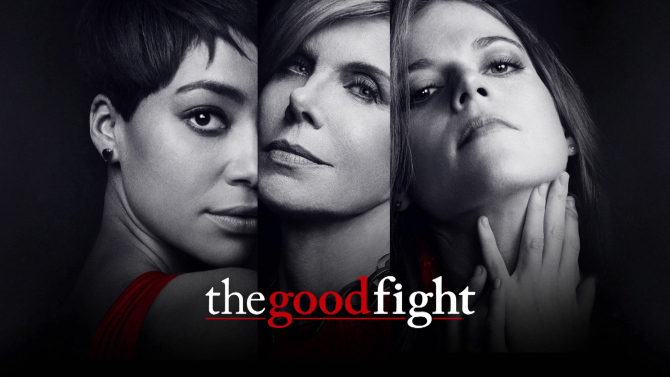 The Good Fight is available exclusively on the CBS All Access digital subscription service and accessible online at CBS.com, on mobile devices via the CBS App for iOS, Android and Windows 10, and on Roku Players, Apple TV, Chromecast, Android TV, Xbox 360, Xbox One, PlayStation4 and Fire TV. In addition to The Good Fight, CBS All Access gives subscribers the ability to stream their local CBS station live, including sporting events like the NFL ON CBS, and watch more than 8,500 episodes on demand - spanning current shows from CBS Television's primetime, daytime and late night line up, as well as past seasons of select series and classic TV hits.